Flipkart on Friday expanded its Billion brand by launching new power banks. The new Flipkart Billion series power banks come in two models - a 10000mAh version priced at Rs. 799, and one with 15000mAh capacity, which will be available at Rs. 999. Both models feature multiple USB ports and are touted to come with "A+ grade" lithium-ion batteries. Flipkart notably announced Billion as its in-house brand back in July last year and brought the Billion Capture+ smartphone as the first product from its new venture in November. The new Flipkart power banks are of course exclusively available for purchase via Flipkart in Black, Copper, and Rose Gold colour options. 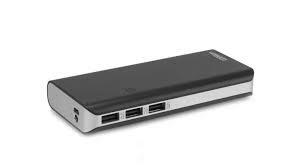 The 10000mAh Billion PB130 RapidCharge and Billion PB129 RapidCharge power banks come with three USB ports, while the 15000mAh Billion PB131 HiEnergy and Billion PB131 HiEnergy has two USB ports. All USB ports are capable of 5V / 2.1A power output. The power banks also sport an LED torch and come with a battery-level indicator. Further, the battery packs available on the power banks are claimed to be designed to lose less than three to four percent of charge when idle for one month; and are rated for up to 500 charge/ discharge cycles. Flipkart says the Billion power banks come with seven-way safety features, including under-voltage and over-voltage protection and built-in temperature protection and short-circuit protection. The new power bank models are also acclaimed to be 13 percent lighter than some of the top-selling power banks. "Our range of power banks has been built with Indians' needs at the core of its design - right from the colours, where research with customers showed Indians prefer rose gold and copper colours over the usual white and grey, to the multiple fast-charging ports," said Hrishikesh Thite, Category Head, Billion, in a press statement. The Flipkart Billion power banks come with a one-year doorstep service warranty. Flipkart is presently also offering five percent discount on purchasing the power banks using an Axis Bank Buzz credit card. Flipkart is apparently set to take on Xiaomi's "Made in India" Mi Power Bank 2i range with its Billion power bank models. The Chinese company launched its new range in last November that comes in 10000mAh and 20000mAh capacities. Furthermore, the Mi Power Bank 2i range starts at 799, identical to the starting price of the Billion power banks.